If you haven’t already heard, PROPEL is an organization dedicated to helping the women of our community discover a profession, enroll in certification courses, and cover the cost of tuition to generate higher income. After a busy month of holidays, PROPEL welcomed the New Year by proudly celebrating its first graduating ceremony. The beautiful event was hosted at the home of Robin and Ivor Braka in honor of the 41 women that completed their certificate programs. A night of acknowledgment, food, and mingling in which each women was awarded her own diploma with the appropriate school classification. It was exciting to learn about each women’s unique interest. The ceremony called upon graduates that have been certified in a variety of fields including Interior Design, Computer Coding, Cosmetology, Personal Training, Paralegal, Graphic Design, Yoga Instruction, Bookkeeping, and the list goes on. 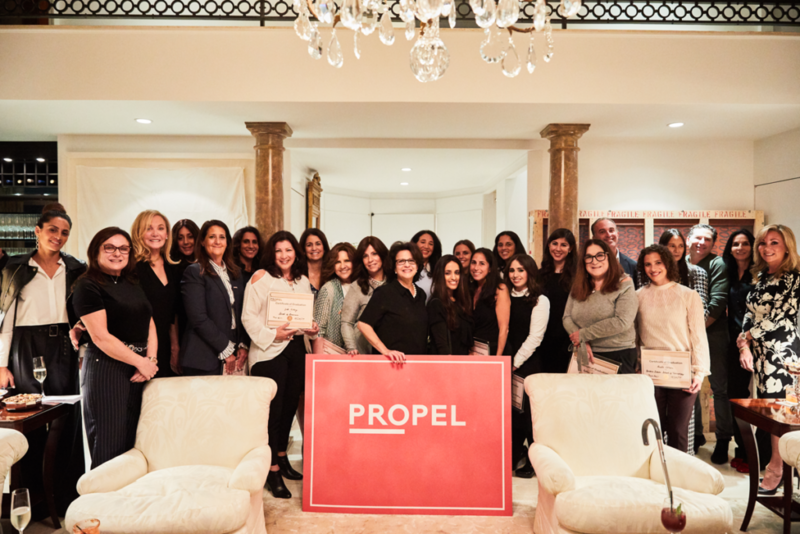 PROPEL’s Board of Directors and graduates traveled into New York City from New Jersey and Brooklyn with their spouses, friends, and family to honor the special occasion. Such enjoyable conversation amongst all the attendees lead to the perfect evening. The busy but exciting week continued on the following evening. PROPEL hosted a unique twist on an event comprising of 4 young working couples on a panel at Arlette Tebele’s pop-up art gallery in Soho, New York. The need for a dual income is greater than ever especially among young couples just starting out their careers and their families. It was touching to see how the new husbands and husbands to be were so proud and supportive of their spouses. For the young women in the audience that would like to embark in a career, it was refreshing to hear not only that they will be able to add to their partners income but to know their aspirations will be embraced. The panel included artist and pop-up gallery owner Arlette Tebele, her fiance David Kassin, Speech Pathologist Junie Maimon, her husband Albert, Founder of My Grandma’s Cheese Florence Cohen, her husband Max , owner of Brooklyn Diamond Coffee Lottie Terzi, and her husband Jack. The Panel discussion was led by moderator and PROPEL Vice President, Dr. Gayle Krost. Overarching themes of the evening included the value of hard work, partnership, perseverance, self esteem, and mutual respect. The young couples on stage were authentic, engaging, heartwarming, and inspiring role models for their peers today. No matter your age, PROPEL works one on one with women interested in obtaining the appropriate training they need to undertake an exciting career and start earning income. Call 646-494-0822 to schedule an appointment with one of PROPEL’s Certified Life & Career Coaches to determine your path to success today! Sign up for our newsletter to stay informed on the latest from PROPEL, events, and more!